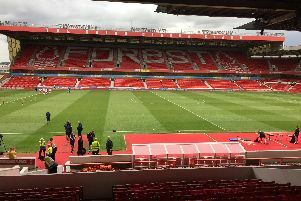 Nottingham Forest’s appointment of a director of football, head coach and signing of an international forward are encouraging signs but it can only be the start of a bigger rebuilding job at the City Ground, writes long suffering Reds fan Matt Brooks. It’s been a long summer but the wait is finally over. Along with a few rays of sunshine, Monday also saw the arrival of Philippe Montanier as head coach at Nottingham Forest. His appointment couldn’t have come soon enough, not necessarily because I was pining for him to take the job but simply because it was a relief to have someone in place for pre-season. Montanier clearly has good pedigree. Promotion at any level of the game in any league is difficult to achieve and qualification for the Champions League speaks for itself. He wasn’t a name that I was familiar with when the club dismissed Dougie Freedman in March but his record and manner in which he addressed the media at Tuesday’s press conference was impressive. Those in charge of his appointment deserve praise in attracting someone with his background to lead our charge in what we all hope will end in promotion back to the Premier League. And so too was the wait for an appointment. But it is one, along with the arrival of director of football Pedro Pereira and new striker Apostolos Vellios, which has been a rare positive against the backdrop of unpaid bills, under performance and unrelenting speculation over the club’s ownership. Suddenly the club, which looked to be drifting towards the end of last season, seems to have found some direction and in doing so given fans something to pin our hopes on - maybe even get excited about. It can only be the start. There have been many false dawns at Forest over the last 17 years since we were last in the top flight and, though the three arrivals are encouraging, more needs to be done. The signs look good. It sounds like more players will follow Vellios through the entrance door now Montanier is on board and the adoption of a more continental recruitment approach bodes well. In an era when a Championship manager is lucky to last the season, why shouldn’t there be more of group decision over players to fit in with the club’s ethos? It’s a model that has worked well at other clubs and, in our current state suits Forest, if further appointments are made. Look down the list of who’s who on websites of the likes of Swansea and Southampton and compare it to that at Forest. If we are to try and replicate, or even emulate, the success of these clubs in recent years then those inside the City Ground boardroom must see it through. Once an environment has been created and a squad assembled, not forgetting the pool of talent already at the club, we will be better equipped for the season and beyond. An element of patience is required but this promises to be the beginning of a long overdue rebuilding job that with a bit of luck - and shared vision - might mean a few more days in the sun.